An LED upgrade is a great lighting solution to save time, money and energy for any commercial or industrial business. You can utilise Light Emitting Diodes (LEDs) anywhere in the inside or out and they come in various designs. An LED upgrade is a simple and fast way to save costs whilst complying to necessary British standards. Why should I Invest in an LED Upgrade? You can save 90% on your lighting costs. LEDs have a longer life than traditional light bulbs. In fact, LEDs can last up to 30 years or 50,000 hours. LEDs, unlike traditional light bulbs, are a solid light source. Traditional Light bulbs expel heat energy as well as light energy, which is effectively wasted. In addition, LEDs are better for the environment as they contain no lead or mercury and emit no UV rays, infrared or ultraviolet radiation. Saving energy reduces the demand on power plants and therefore reduces our greenhouse emissions. A small change that saves you money can help to save the environment. Forget the maintenance for constantly changing blown light bulbs, LED lighting is reliable and robust. It is suitable for indoor and outdoor use and switches on instantly, without the flickering we now associate with low voltage bulbs. Long lasting and powerful. Ultimately best suited to industrial complexes. Long wide beam and three levels of protection from dust, water, and vapour. As a result, tube lights are commonly used in large industrial environments with harsh conditions. Here at Paul Hunt Electrical Installations, our qualified professionals and are able to advise you on the best solutions for your industrial or commercial premises. You can have instant bright lighting which saves you money and reduces your carbon footprint. 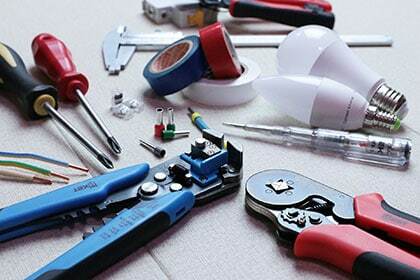 Our electricians deal with everything from consultation to installation. Why not contact Paul Hunt Electrical Installations today to discuss an LED upgrade today.